The Central-Pacific state in Mexico where the town of Tequila is located. It is also where the vast majority of the agave used for tequila is grown, harvested and distilled. Harvesting. The operation of cutting all the leaves from the agave, pulling the piñas out of the ground before shipping the piñas to a fabrica for processing into tequila. 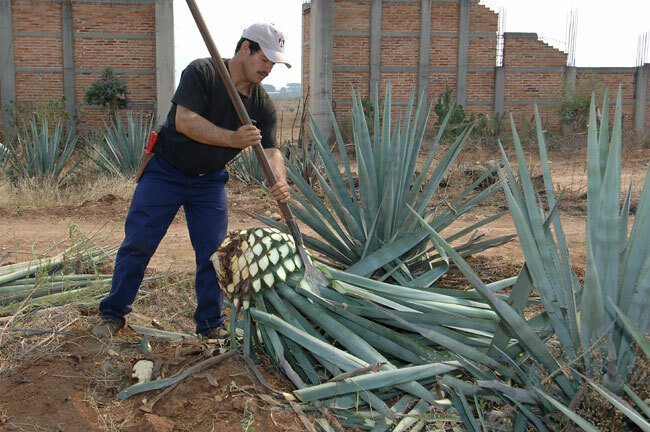 The skilled laborer that harvests mature agave plants in the fields. The jimador's task is a crucial one, since he decides when the plant is ready, usually 8 to 12 years after it is planted. The tool he's using is called a coa. It has a sharp, round metal tool on the end of it that's used to pull up the plant and slice off the leaves, leaving a pina, which is Spanish for pineapple or pine cone -- which is what the agave looks like after it's been reduced to just the heart. The jimador is often one of three generations of farmers in the same field. The skills are passed from father to son. Sometimes called a desvirador. If you are fluent in Tequila, but not Spanish, here’s a short language lesson  Jose Cuervo translated into English means “Joe Crow,” though translated into any language, Jose Cuervo means great Tequila. In 1758, Jose Antonio Cuervo received a land grant from the King of Spain to grow the agave plant from which Tequila is derived. Then, in 1795, Jose Maria Guadalupe Cuervo, the father of Tequila, was granted an exclusive permit from Spain to produce mezcal wine from the town of Tequila. Young or Smooth - After the tequila is distilled some producers allow it to settle and finish for a few weeks in the tanks before bottling. Some add coloring or herbs which impart a pale golden color and then age for one or two more months. These tequilas are often called suave, joven, gold, or abocado, implying youth and smoothness. Tequila Joven may also be a blend of white Tequila with other rested or aged Tequilas. Cleaning or weeding. Clearing the grass and weeds away and removing the soil at the foot of each agave plant. Worker use a Coa, leaving an empty space of "one and a half vara" wide (about 4 ft.) One vara measures 83.5 centimeters or 2.8 feet. The Highlands. One of the major growing regions for the Blue Agave plant, Los Altos is a mountainous area with rich red volcanic soil east of Guadalajara in the state of Jalisco. Mother. A mature or “Mother” agave plant from which hijuelos are taken for re-planting. Matured, another term for reposado. Master, teacher. The skilled worker or supervisor who oversees less experienced workers. The name given to the agave plant by Spanish explorers. The term Maguey is used as a generic description of agave plants. The agave field workers that harverst the mature Maguey plant, more generally called jimadores. Surveys show that the margarita is the most popular drink ordered in bars and restaurants around the world. This popular cocktail is made with tequila, lime juice, and orange liqueur. There are many variations to these basic ingredients. Its origin has never been definitively proven, but it was invented sometime between 1930 and 1950, probably in Mexico. Today, about 60 percent of the margaritas consumed are ordered on the rocks and 40 percent are frozen. Another name for maguey plant. Also the generic name for all spirits distilled from the agave, as well as the name of a regional beverage, similar to tequila, but made mostly in the state Oaxaca. Mezcal is not the same as Tequila  the two should never be confused. Mezcal is similar to Tequila in that it can be distilled from blue agave, although it seldom is, but it is distilled only once, unlike Tequila which is distilled twice. Mezcal can be made from any species of the agave plant (most typically from El Moraleño, Espadín de Oaxaca, Bermejo and Zopilote) in any part of Mexico. (If you were looking for the worm, you’ve found itmescal is often bottled with a worm.) Technically, tequila is a form of mezcal. Mezcal is native to the states of San Luis Potosi, Michoacan, Jalisco, Durango, Morelos, Nuevo Leon, Oaxaca, Tamaulipas and Zacatecas. Another prehispanic name for maguey. Tequila produced using a mixture of at least 51 percent agave sugars and other plant sugars. Fermented agave juice must be distilled twice. The final product must be produced from no less than 51 percent reducing sugars obtained from the cooking of the blue agave plant, with the remainder being produced from other natural sugars. If the label doesn’t say "100% de agave," or a similar statement (see 100% Agave) then the product is a mixto tequila. Corn or sugar cane are the most common other sugars used to create the alcohol during fermentation. Mixto is one of the two official catergories of tequila. The other category is 100% agave. Millers. Distillery workers who are in charge of the tahona and grinding - mashing process. Mill or grinder. Stone grinding wheel used to crush agave used in making mezcal. See also tahona. Must. The unfermented juice, agaumeil, and solids extracted from the roasted agave piñas after the grinding stage that will be fermented to produce alcohol. Municipality, county or district, town or township. The name of the original native Mexicans who lived in the area now known as Jalisco, before the Spaniards arrived. Native to Mexico Nopal is a member of the cactus family, and is commonly referred to as “prickly pear”. Nopal is a great source of vitamin C and extremely nutritious. Its fruit, known as “tuna”, is served with lime juice for breakfast or lunch. Water wheel - a stone grinding wheel, similar to a tahona or molino. The official norms, or standards. Frequently written in all-caps as NORMAS. Normas Oficiales Mexicanas - NOM. The system for Mexican government standards. There is a section in the NOM for tequila. Every distillery gets a NOM identification number to show they conform to the laws and standards governing tequila production. The NOM number identifies each distillery. Each distillery with a NOM may make several products for different companies under the same NOM identifier. The NOM number does not guarantee quality, only that the distillery is properly licensed.